Every once in awhile an app rolls through Tapscape and totally delights. 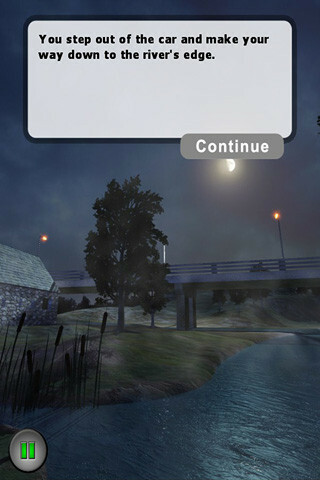 Murder Detective: Hampton Bridge Murder is one of those apps. 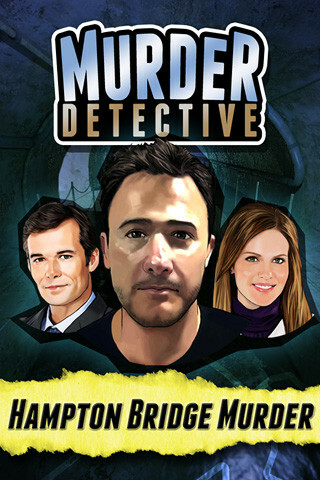 Released a couple weeks ago by the relatively unknown Tournay Software, Murder Detective is a solve-at-your-own-pace game-story hybrid with legitimate pop. Designed like a choose-your-own-adventure story for the iOS generation, the game sends Detective Phil McDermott and his partner on a murder case that spirals into conspiracy. After a short period getting a little background information on your recently divorced and heavily drinking character, the murder mystery spins into action. 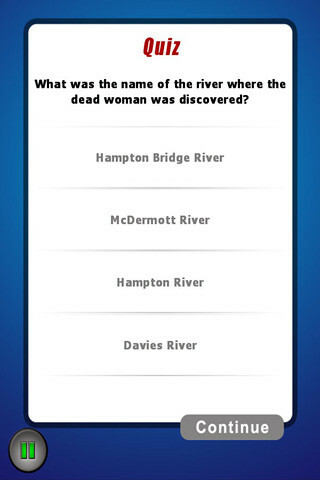 When a young woman’s body shows up dead at the Hampton River the choices begin. As you scroll through narrative boxes in an attempt to uncover clues, the app presents you with menus of choices that determine the fate of both the case and your life. Choose to walk through the front door of a suspect’s house, for example, and meet your certain demise as a trip-wire activates a bomb to blow up the house. Opt for entering through the back door though, and survive long enough to uncover a few more clues. 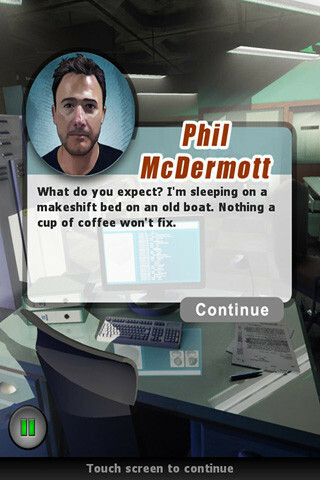 These are the kinds of choices Phil McDermott must make in between divorce, drinking, and lusting after an employee back at the station. As far as stories go, Murder Detective: Hampton Bridge is the ultimate of page-turners (minus the pages). Although gamers will only see a total of six or so static graphic screens over the case of the entire game, the illustrations are cohesive and well done. This isn’t an incredibly action oriented experience (in fact the only thing gamers ever do is press Continue, choose between a few on-screen alternatives, and take quizes), but if you’re okay with forgoing finger-tapping action Murder Detective will please and delight. There’s something about absorbing the snappy small doses of narrative that’s really enjoyable, and the choose-your-own-adventure component is totally addictive. Plus, there are a few on the spot quizes that determine your detective rank if you make it to the end. That said, there are a few aspects of Murder Detective that could use some refining. For example, the game lacks user profiles. As a result, you can only run through one narrative at a time and it’s hard to tell if the detective story will pick up where you left off. I also think some more interactive components and screen illustrations would pull more players into the experience, but for a first stab at reinventing narrative style, Murder Detective does a brilliant job. 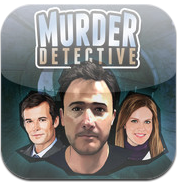 I hesitate to say more because I don’t want to give away any spoilers but I can tell you this with certainty: Murder Detective: Hampton Bridge was one of the best apps I’ve downloaded in months. Bottom Line: Murder Detective is a simple choose-your-own-adventure style murder narrative that reads like a game but plays like a story. Highly recommended for anyone interested in how iOS will continue to transform narrative styles.